CalNit®FORT 15-0-0-19Ca is unique combination of nitrate nitrogen and fully water soluble calcium. It is suited to application through all fertigation systems. CalNit®FORT 15-0-0-19 can be mixed with all water soluble fertilizer, except stock solution containing either phosphate or sulphate. 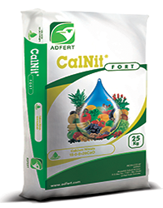 CalNit®FORT 15-0-0-19 is an indispensable component in all well balanced fertigation programs, both for soil grow crops & hydroponic systems.